Junk – the word has bad connotations for North Americans – so the idea of spending a night on a junk in Ha Long Bay was received with mixed feelings. “Don’t worry”, said Huy our guide “You will have a soft mattress and a small private shower.” In fact what we had was a beautiful room furnished in rich warm woods, crisp white linens and a constantly changing view of magical Ha Long Bay. Now that it has been named one of the natural wonders of the world Ha Long Bay is certainly busy with visitors from all over the world. I couldn’t help wondering what it was like for those intrepid travellers who ventured out to this region before it had been “discovered”. It must have been magical. Even with numerous junks and day trippers the area has a certain mystery about it – especially when the mist slides over the sea and wraps around the tall jagged islands. Our visit there included a ride around a floating village. 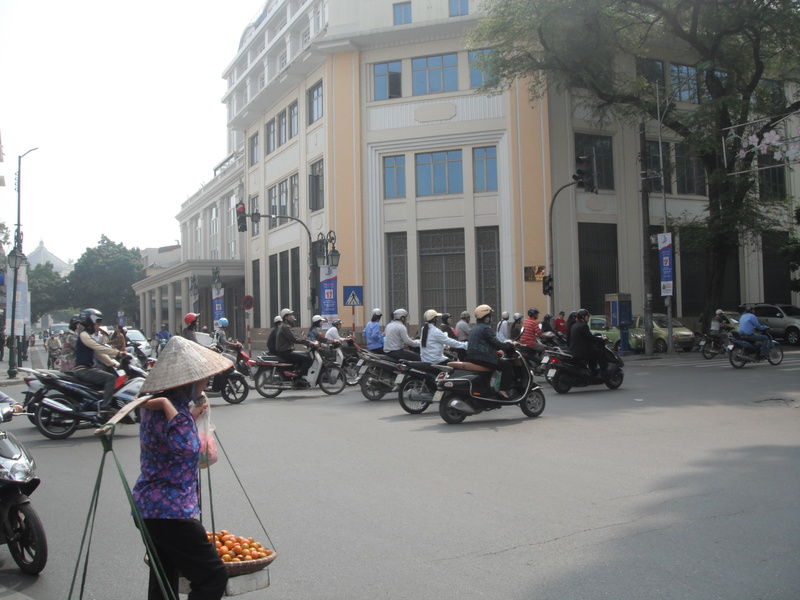 The village is relatively new, about fifteen years, and was a brilliant solution to the overcrowding of Hanoi. People without homes were offered the chance to come out and start a fishing village and pearl farm which in turn has developed a little tourist industry all of its own. The local people – mostly young girls – ferry visitors around in traditional Vietnamese boats – almost like a gondola in a way. Kids here learn to row from an early age and we saw several very small children lying back in the boats and operating the oars with their feet. Other highlights of the area include visits to immense caves in the heart of the limestone islands as well as a gruelling 400 step walk up to the top of one of the islands for the “view”. That’s if you can breathe by the time you get up there. Phew! In the heat and humidity that was a mini marathon. By the time we all got down to the beach a dip in the sea was a must – even without a swimsuit. Yes some of our ladies just walked right in with all their clothes on! Good for them! Now that’s pretty good advice if you ask me. Forget about traffic lights. They work for the most part but don’t be surprised to find scooters, motor bikes or even cars driving around you, in front of you and behind you while crossing at a pedestrian crossing. Oh and don’t get too relaxed walking down the sidewalk. Many bikers use this as a handy way to avoid the traffic. Go figure. I use the term “bikers” loosely. For us in North America it conjures up Hell’s Angels or mid-life crisis executives clad in black leather from head to foot sitting confidently astride beautiful Harleys or BMW’s. 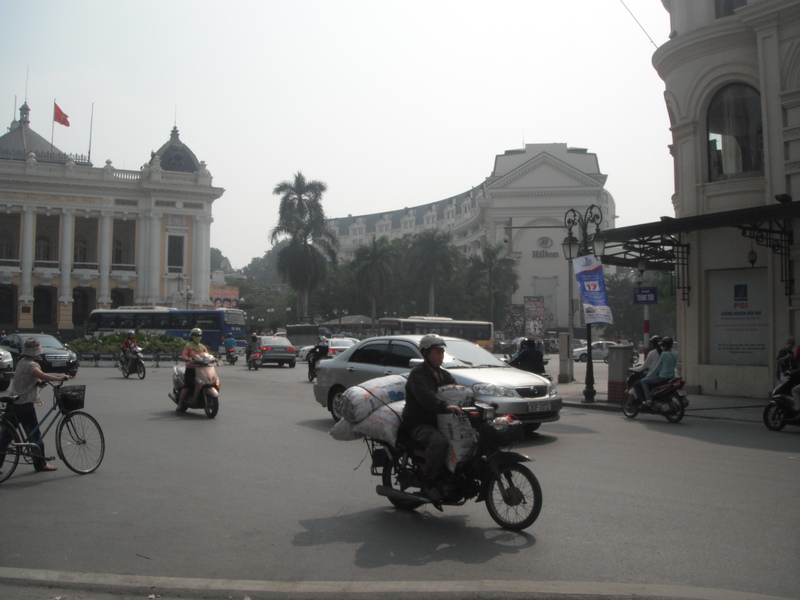 In Hanoi a biker could be literally anyone wanting to get from point A to point B. Lots of girls. Pretty office workers in stockings, suits and heels. Moms and Dads with one or even two babies wedged between them. It’s amazing what these bikes can do and how the riders can balance huge bags of rice, baskets piled sky-high and very long unwieldy aluminium ladders with no sight of that familiar red cloth tied to the end. It’s pedestrian beware and the sight is enough to make any North American traffic cop want to hang up his radar. I was astonished to see a group of tourists on a bicycle tour through the city. Truly they deserve a medal – maybe this is going to become an Olympic sport one day. It would certainly call on athletes with nerves of steel and great balance – qualities unfortunately that I do not possess. So you won’t be seeing me on the bike in Vietnam – at least not in Hanoi that is.